Take a turn down a small street in Old Town Scottsdale, and you’ll find Hotel Indigo at the end of it. Tucked away from the main drives, this luxurious boutique hotel is the perfect hideaway for a romantic retreat, furthering your business, or just having a great time. With all the amenities of a larger resort, but small enough to be intimate and cozy, Indigo is the perfect fit for almost any occasion. When you check into your room, the first thing that’s bound to catch your attention is the beautiful hardwood floors. Rather than worn carpet like a lot of places, the hardwood floors at Indigo provide an extra level of posh to your stay, and with the fluffy area rugs, there’s no need to worry about cold feet. There are 117 guest rooms with 9 suites. All are non-smoking so no need to worry about the Surgeon General here. The room amenities are modern and functional as well as luxurious. LCD TV’s, complimentary wi-fi, a spa inspired shower, in room stereo system with mp3 player, art murals, and coffee makers are just some of the comforts you can expect here. You’ll also be sure to get a good night’s rest on your Desert Dream Bed complete with fluffy, oversized pillows. Bring your dog along too for no additional fee, and you’ll be sure to get a special doggy bed just for them. Stay in your room for private in room dining, or venture out to the 44fifteen Bar and Bistro. Open for breakfast, lunch, and dinner, you don’t want to miss out on the amazing selections offered here. Relax in the indoor/ outdoor urban bistro with views of Camelback Mountain. Book a private party, or lounge with friends by the outdoor firepit. Have an unique cocktail at the bar like a Sweet and Tart or a Purple Margarita. If beer is more your style, there’s an ample selection of domestic and import bottles. If you’re a wine lover, a selection of wines from around the world are awaiting you. Of course you’ll want to eat. Breakfast touches on southwest flair like the Old Town Breakfast Burrito made with chorizo and green chilies, or go for the sweeter side with Sun Kissed French Toast, and don’t forget to have a shot of espresso to jump start the morning! For lunch or dinner selections Steak del Sol, Salmon BLT, and Hacienda Chicken Pecan Salad are sure to satisfy you. For the ultimate in pampering, take the free shuttle to the nearby Lamar Everyday Spa for a day of indulgence. With an array of spa and salon services for women, men and couples, let yourself be taken care of for the day, or just an hour or two. Relax with services like therapeutic massage, tropical body scrubs, or an optimizer facial. Stretch the stress away with a yoga class, or look your best with a wax, shampoo, and hair style. Bridal services are also offered. Open seven days a week, you’ll never have to wait to use their services, steam room, sauna, or pool. 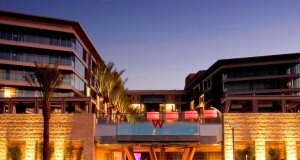 Speaking of pools, be sure to grab a lounge chair with umbrella and relax by the onsite pool at Indigo. Perfect for working on your tan with a cocktail from 44fifteen. If you’d rather sweat away your stress, there is a state-of-the-art fitness center with all kinds of workout equipment. When you’re trying to impress business clients, the Hotel Indigo is a great place to hold a meeting. The meeting room accommodates up to 12 people, and rental price includes a flipchart, whiteboard and markers, pads and pens, AV equipment, and food and beverage service. After the meeting, feel free to have a business lunch or dinner at the restaurant to complete the deal. A business center with equipment is available. If a wedding is your wish, the Indigo provides discounts on blocks of reserved rooms for out of town guests. 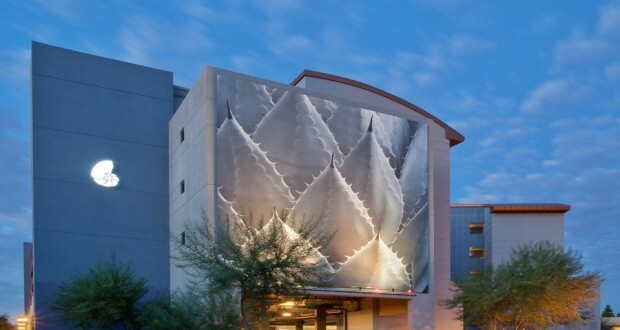 Many popular reception venues are within walking distance like the Scottsdale Center for the Arts, Scottsdale Civic Plaza, and Desert Botanical Gardens. If activities are calling you, feel free to work with the Hotel staff to coordinate a golf adventure, a shopping excursion, or a taste of western nostalgia and art in Old Town. If it’s the nightlife you crave, there are plenty of options. 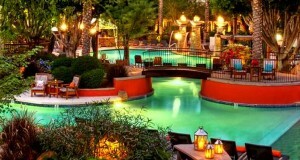 When the sun goes down in Scottsdale, the party just gets started. Take advantage of many of the nearby clubs and bars. Several are within walking distance, so you don’t need to worry about driving, or even taking a cab. Cabs and the trolley are available for clubs a few miles away. The centralized location of this hotel makes it a certainty that you’ll never be bored no matter what you’re looking for.